It is our mission at the Olivia Raine Foundation is to compassionately offer financial support for expenses relating to the funeral arrangements to any family who has had an infant pass away for any reason. At the ORF, we understand the emotional stress that a family is under during these difficult times and although we cannot lessen the emotional grief, our hope is that we can in some way assist your family during these difficult times by helping to lessen the financial stress and by helping to provide a beautiful final resting place for your beloved infant. The Olivia Raine Foundation is a 501(c)3 non-profit organization. •Stillbirths occur in nearly one in 200 pregnancies every year. •The causes of stillbirth include: placental problems, birth defects, growth restrictions, bacterial infections, umbilical cord accidents, trauma, maternal diabetes, and high blood pressure. •Premature births occur in 8-10% of all pregnancies in the US: it is one of the top causes of death in infants. age. 5000-6000 deaths are attributed to SIDS every year. •Birth defects account for 3% of all infant deaths every year. •27,864 infants die before their first birthday. 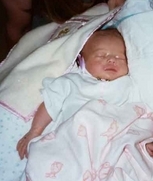 was born August 31, 2002 to Charles and Kimberly Richards. Olivia was born with a birth defect called CDH or Congenital Diaphragmatic Hernia.